I was thinking about going on a benefit ride with my husband this weekend, and thought that would be a great thing to start blogging about on our personal website at dennyandlori.com. So today, I hopped onto my Dashboard to make a post, and saw that I had an additional incoming link – and all bloggers know how cool that is. So I went to take a peek. The title of the post is the “Good, Bad and the Ugly”, and that of course intrigued me to continue on reading. What I saw made me feel good about the way I do business, always giving credit to those who deserve it. Our blog is a brand new site that I have not even had a second to think about for a theme. But I wanted to go ahead and start teaching my hubby how to blog, so I set out for a very specific layout that had ‘Harley-Davidson’ colored design theme I could toss up for a while until I got the free time to create my own. Now what made me feel so good about this new link into my blog is that the designer of the original template, though I changed it only slightly, thanked me for not removing the credit for his work. 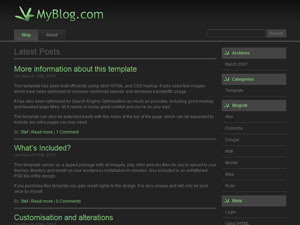 That got me to thinking about how many blog themes probably have the credits ripped off either unchanged or customized. It just gets me that people want to take credit for other’s hard work – I know it is something that is never going to stop but it really does get my goat. Maybe the Sheila from down under (Site rips? is that flattering?) can learn from this. Honesty is the best policy. Is this what you had in mind for this weekend? The ride will begin at Gordon Central High School. Registration begins at 8am, first bike out at 10am. For more ride information, contact Don or Cindy Mincey at 706-625-1907. 6th Annual Ride for a Miracle. Live music from Cross Plains. Food available from Outback Steakhouse. In-store sales. Give-aways and more! All ages and bikers welcome. @Denny: LOL! Yes, if she ever has the nerve to come back here again! Yes, I do believe that is the one you mentioned. read more about SQL for my work as db2 database manager. Site Rips? Is That Flattering?